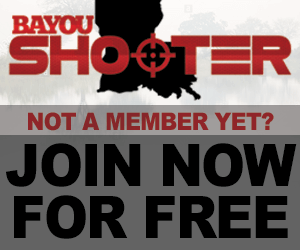 YOUR REGISTRATION WITH WWW.BAYOUSHOOTER.COM CONFIRMS YOUR AGREEMENT TO IT'S TERMS AND CONDITIONS LISTED ON THE HOME PAGE. Failure to abide by these rules will cause a moderator/administrator to edit or remove your thread without notice. Continuous violations may be cause for you to be banned. Summary: New threads MUST have; Price, Picture, Contact Info and Location. 1) For sale threads must have a price. No 'make offer' threads. Feel free to put or best offer (OBO), but at least start with a price. a) WTB (want to buy) threads do not need a price. b) WTT (want to trade) threads do not need a price unless there is the possibility of an outright sale.Please state an item or items you are willing to trade for! c) Your thread's title must clearly state the intention of the ad. This means whether you want to sell, trade or buy. Widely accepted acronyms are preferred (WTS, WTB, WTT, etc.). 2) Must have Photo(s) for WTS and WTT threads. The photo does not have to be of your item, but at least a stock photo of the item you are selling. Be aware that you'll have a better chance of selling your item if you use a photo of your item. You must post a picture at the time of posting, if you don't have a picture available find one on the internet that will work as an example or wait to post the ad when you do have one. A clickable link to a website containing a pic does not count. THE IMAGE MUST SHOW UP IN THE THREAD. 3) Bump Post: Replies to your thread are allowed once per day. You may NOT bump your AD the same day you have listed it. 4) Location. You must have the location portion of your profile filled out. This is accessible under the "Settings" menu at the top of every page (click here). Location must be the city/town you live in or are closest to. It is advisable to mention your location in the thread as well. 5) Upon closing a deal or removing an item for sale, please edit the thread to show the item as sold. You need not delete the thread or remove the information in it. Simply notating that the item is sold shall suffice. This helps keep track of the item. -If you are interested in an item, please contact the seller via PM or the contact method prescribed in the thread. You will be unable to reply to the thread. -By using the BayouShooter PM system, a written log of all messages is kept and you can use the report message button if a problem arises. This method of communication links all conversations to an account and aids in accountability. If you attempt to reply to someone's thread you will see an error message. If you have a question, trade offer, gripe, purchase offer, etc, you must contact the poster either via the supplied contact information or via PM (PM is advisable). BILLS of SALE (BOS): BayouShooter advises that all purchases are accompanied by a bill of sale with a valid government issued ID. While a BOS is not necessarily mandated by law, it is generally a good idea as it protects both the buyer and seller. Sponsors are allowed one thread in the classifieds, outside of the sponsor's classifieds, to advertise their business(not one per category), which must meet the same rules as a standard ad. You can place as many items as you want in your thread. Once an item is sold, please EDIT the item out of the thread, do not create another thread. Additionally, please place the thread in category the which most directly relates to your business. EX: Pawn & Gun would go in one of the firearms classifieds, while a camping supply store would go in the General Outdoors classifieds. 1) NO copyrighted, trademarked, or other items that have a registered and protected intellectual property right connected with the sale (i.e., copies of MS office, photoshop, etc.) unless you are an authorized distributor. 2) NO items that are deemed illegal by the State of Louisiana, the state in which the seller resides, the state which the prospective buyer resides, or the Federal government. If you have an item such as a 'widget' (for example) that is illegal for sale in Louisiana, DO NOT SELL IT. If it is legal to sell but that sale requires certain legal process to take place, then it is authorized. The onus is upon the seller/buyer to ensure those processes are completed. 3) Once your item is sold, please edit your thread using the Edit button and change the TITLE ONLY and add SOLD to the end. Please do not edit the actual ad as we want to keep track of how things were advertised in case any problems arise. Edit your Thread Title with "SPF(Sold pending Funds)," "Sold," "Traded," "Gone" etc. This is to aid the moderators as well as buyers by knowing what the current status of the Sale AD is and whether it's still available. In your original post, click Edit, then Go Advanced and edit the title from there. The sales of ANY item with damaged, obscured, or obliterated serial numbers is FORBIDDEN! This board will not facilitate anything that is grey market, black market, or has the possibility or appearance of being either. Violation of this Rule will lead to having your account Banned from the Website Permanently! If someone attempts to sell an item with a damaged serial number, please report them to your local authorities and to a site staff member. It has come to our attention of the possibility of a Seller who might participate in unlawful sales of Ammunition and/or Firearms not necessarily due to an ignorance of the Law but also the possibility of willful disobedience to the Law. If guns are your hobby, great, we understand wanting to try them all. If you want to make constant income on firearms and/or ammo, you should obtain a Federal Firearms License. If you break ANY Local, State or Federal Laws in the course of a sale you make in the marketplace, Bayoushooter.com will cooperate fully with any investigation by local, state, or federal law enforcement. If you misrepresent items you are selling,(i.e. selling reloaded ammo as new), you can be permanently banned from Bayoushooter.com. In Final; Ignorance or Willful Ignorance to the Law by no means provides you an exception or excuse to the Law. These rules are subject to change at any time without notice. It is the duty of the members to stay up to date on the most up to date rules. Individual ads are conducted by individual members and do not represent BayouShooter.com or it's staff. If you see an ad in violation of any of these rules or any law, please use the report button to alert site staff.